Casino Midas was founded in 2012. 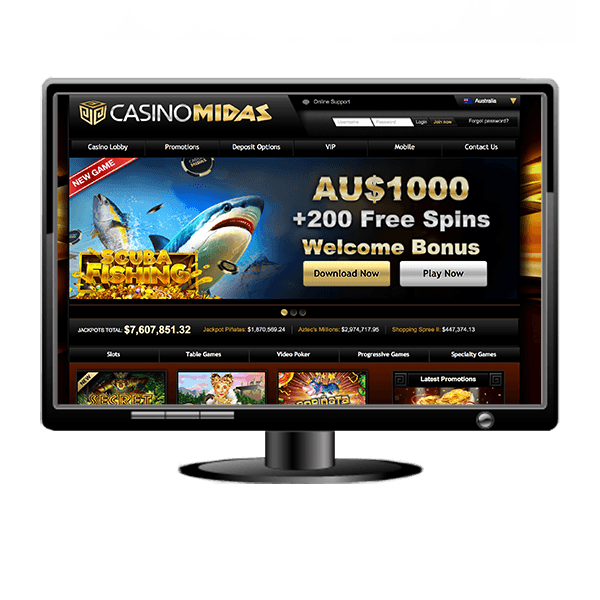 Casino Midas runs a dedicated portal for players from Australia and allows Aussies to deal in AUD rather than USD, which gives the site a slight edge over other Australia-friendly RTG casinos in terms of convenience. The welcome bonus offered by Casino Midas is average – many sites can give you a better match on your deposit – but is balanced out by the particularly generous number of free spins. The bonus is subject to a 40x wagering requirement, which should give every customer a chance to clear it. Note that low-house-edge games, such as blackjack or video poker, contribute only 10% or less towards completing this playthrough. Like most RTG sites, Casino Midas is best suited for players who enjoy high-variance jackpot pokies, video poker, or other casino card games. If you tend to focus on roulette or low-variance slots, we recommend joining a site that's powered by a different software suite. There are two ways to access Casino Midas on your desktop computer. The first is to download the casino client, which has the added benefit of slightly sharper graphics and faster loading times. The second is to visit the website and launch the Instant Play app by clicking the Play Now button. The Instant Play app is compatible with all HTML5-ready browsers, but you can also use an older browser equipped with an Adobe Flash plugin. Casino Midas is an RTG-only site, which means it doesn't host any games designed by other developers. You can expect 110+ pokies and 30+ table games and unique video poker games. Around two-thirds of the pokies offered by Casino Midas are jackpot games that are similar to standard video slots in gameplay – they rely on high-quality graphics, wilds, scatter symbols, bonus rounds, free spins, and other modern features to keep the player engaged. However, the payout structure is completely different – the jackpot acts as the main prize, and standard line wins don't pay as much as in normal games. As a result, these games tend to be highly unpredictable, which might be off-putting for profit-oriented, calculating gamblers. However, Casino Midas isn't all about high-risk, high-reward action. The RTG table games and video poker titles offered here are the polar opposite of such slots – they're highly consistent and give the house a minuscule advantage. Optimally playing these games requires a lot of skill, so we recommend sticking to titles you're already familiar with. If you're looking to get the most bang for your buck, you should stick to Aces & Eights for video poker (0.22% house edge) and Perfect Pairs for blackjack (0.54% house edge). Unfortunately, if you're a roulette enthusiast, your options are limited to the classic American and European variants of the game. You can also play baccarat, tri-card poker, pai-gow poker, keno, and a few scratch-card games. The mobile version of Casino Midas’ software is browser-based, which makes it compatible with a wide range of operating systems, including Android, iOS, Blackberry OS, and Windows Mobile. The games are comparable to their desktop counterparts in graphics and sound effects, but not all titles can be accessed on the go. You can play around 80 slots and 20 table games and video poker variants. The games load fast, even on a 3G connection. A stable connection is always recommended, but getting disconnected is no big deal as every bet is processed server-side as soon as you place it, and your account balance is always updated to reflect your spin's outcome. Visa and MasterCard are the default deposit options for Aussies, and you should contact support if youd like to deposit using a different method. Withdrawals are usually handled via a bank wire transfer. Every withdrawal request can take up to 96 hours to process, which is slower than the 48-72 hour industry standard. You receive priority treatment if you're a VIP, and the casino handles your request within 12 hours if you reach the VIP Platinum class. Nevertheless, there are many RTG casinos (Casino Extreme, Kudos Casino) that offer fast banking services by default. Casino Midas imposes very low cash-out limits, which can be problematic for high-rollers. Initially, you cannot withdraw more than AU$2,000 per week. Once you become a VIP, the limit is increased to AU$4,000. This upgrade is not a huge improvement seeing as you need to deposit a minimum of AU$3,000 and then bet at least AU$200,000 to reach that status level.